Who doesn't love a cocktail weenie? 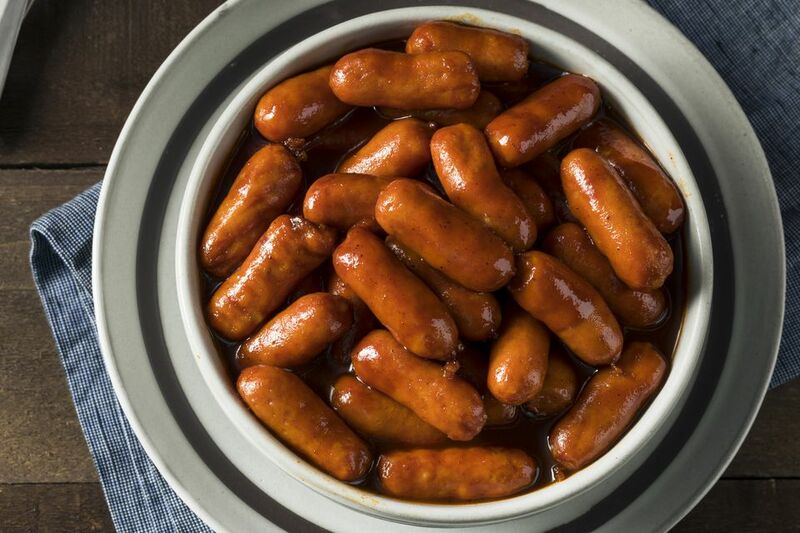 Bite-sized hot dogs (cocktail wieners) or sausage are cooked in a tangy ketchup and brown sugar sauce in the crockpot or slow cooker. It's the perfect appetizer for a Super Bowl party or any party or gathering, all with minimal prep. The sauce adds barbecue flavor to the addictive little hot dogs, and it makes a nice alternative to the classic grape jelly sauce or bourbon mixture. Li'l Smokies (mini smoked sausages) or cocktail franks work well in this dish, but standard hot dogs or smoked sausages are good as well. Just cut hot dogs or other larger pieces into 2-inch or 3-inch lengths. Serve the cocktail franks right from the slow cooker. Make sure you provide plenty of napkins, toothpicks, and plates for guests. In the slow cooker, combine the ketchup, brown sugar, red wine vinegar, soy sauce, mustard, and garlic powder. Stir to blend the ingredients thoroughly. Cover and cook on high for about 1 hour. Add the hot dogs and stir to coat them. Cover and cook on high for about 1 to 2 hours, or until the hot dogs are piping hot. Turn the setting to low (or warm) and serve them hot from the slow cooker. To transport the cocktail franks, cook them as directed. Put the slow cooker in an insulated carrier or wrap it in blankets or newspapers to keep it hot. When you reach your destination, plug it in and set it on high until hot. Turn it to warm or low for serving. Add some heat to the sauce with about 1/2 teaspoon or more of crushed red pepper flakes or some cayenne. For fruity, sweet-sour flavor, add about 1/2 cup of drained crushed pineapple to the sauce mixture. If you like your barbecue sauce to have some smoked flavor, add a teaspoon of liquid smoke or some mesquite or hickory barbecue seasoning. For a bit of honey or maple flavor, replace the brown sugar with honey or maple syrup. Give the recipe an upgrade with bacon. Wrap each cocktail hot dog or mini smoked sausage with a half strip of partially cooked bacon (cook it just until fat has rendered, but it is still soft and flexible) and secure each one with a toothpick. Add them to the sauce mixture and cook as directed. Instead of hot dogs, add 1 to 2 pounds of your favorite homemade or frozen meatballs. Use mini meatballs, if possible. For nippy franks—adults only—add 1 to 2 tablespoons of a good quality bourbon to the sauce mixture.